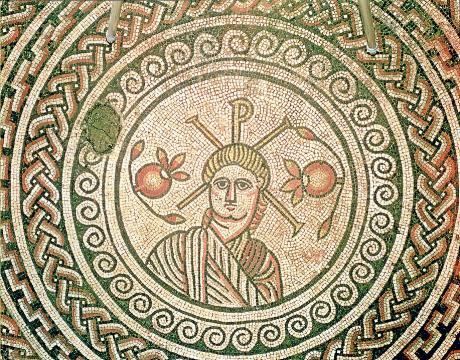 Christianity and Druidism were the two most hated religions in the Roman Empire. Druidism is covered in another article, but for the purposes of these writings, we shall concentrate on Christianity. When Christianity first reached the Roman world around 30AD, it was treated as an outlawed religion to the extent where Christian believers were persecuted to the point of execution. Yet by 325AD, it had become the norm as the religion of the Roman Empire. The big difference between Celtic and Roman paganism and Christianity is that the pagans believed (and still do today) in a variety of Gods, each controlling a different aspect of life. Christianity involved the worship of one single God who watched over the whole humans and their lives. To understand why the Romans hated Christianity, we need to examine the basic differences between the two religions. The Celts and Romans did not understand nature and life. To the pagans a thunderstorm was the gods expressing their opinion their followers had done something to upset them and this was the gods way of letting them know. Infant mortality was extremely high as Iron Age people had no knowledge of germs, disease, in fact anything that could lead to an early dead. They saw a death as the gods punishing the family for an indiscretion. Failed crops were the gods exacting punishment for something the tribe had done to cause the gods to become angry. A good harvest was the gods rewarding the tribe for outstanding service. A birth was the gods rewarding the family. No matter what happened, the gods were behind it. Christianity held completely different beliefs about life. A thunderstorm was a natural occurrence. The death of an infant not punishment, it was 'God's will'. The family had not upset the Christian God, he had just willed it should happen. No reason needed to be given. The pagans believed in many gods, each representing a different aspect of life. The Christians believed in one almighty god who oversaw the whole world. To the pagans, this was against their ingrained convictions. Although the pagan gods were considered perfect, no one god could control the whole world. The pagans accepted killing as part of human life. It was necessary to kill to survive and prosper. The Romans also deemed killing was acceptable and, even worse, enjoyable as a sport. The more bloody and drawn out the death process, the more they liked it. The Christians believed that all killing was wrong. It was the width of the chasm between Paganism and Christianity that caused the problems. North and South. Right and wrong. Black and white. Extremes in the extreme. The answer is fairly straightforward, but consists of many aspects. As already mentioned, the extremes of attitude between paganism and Christianity were the cause of the problems between the two religions. But to the Romans there was one part of Christianity that the Romans found totally intolerable. Believers of the Roman religions had to swear allegiance to the emperor and accept him as the corporeal embodiment of the gods. Indeed when an emperor died, he would often be elevated (deificated) in status to the level of a god. The acceptance of a physical god in human form was the foundation of Roman religion. The Christians would never give such devotion to the emperor, as they only acknowledged one almighty God who did not have a physical equal on earth. The Christian refusal to affirm their belief in a mortal god-like emperor was the main reason for their persecution. This belief was known as the 'Imperial Cult'. The cult originally started life during the reign of the mad emperor Caligula, who ordered all Roman citizens to look upon him as a god. This was unheard of as it was customary for an emperor to be granted god status after his death. Not while he was still alive. In every country the Romans occupied, they built a temple to the Imperial Cult. 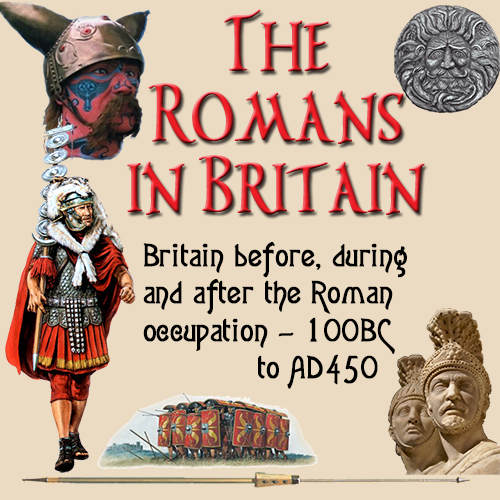 In Britain this was in the original capital of Camulodunum (Colchester). Christianity took a long time to become acceptable to the Romans, but when it did eventually become fashionable, the speed it spread was incredible. How it came to Britain is unclear. It has been said St. Peter came to Britain accompanied by Joseph of Arimathaea, but we do know it was first found in areas of Britain the Romans had not yet conquered. From this it means the Caledonian tribes of Scotland were the first to embrace Christianity, and it was they who introduced it to England. For the first two hundred years of its existence, Christianity was persecuted in the extreme. This new religion is assumed to have been accepted by the poorer people in Britain and was originally only talked about in private, and then only to trusted believers. Services were held in secret in the homes of followers and as the religion grew, this was impractical. So the meetings came to be held in more public places,with temples appearing at many towns in Britain. However, it gradually gained strength as more converts took to the new beliefs. As Christianity spread throughout the empire, the Romans were left with a choice. Either embrace it, or destroy it. Initially they tried for the latter. By the third century A.D., it had become too big to drive out of Roman society. So radical were the teachings, people of the middle and upper classes began to take on Christian ways. By 200AD, it had become one of the major religions throughout the Roman world. By this time it had grown too powerful for the Romans and they decided to obliterate it from society. Such a religion that was severely opposite to the pagan ways had to go. 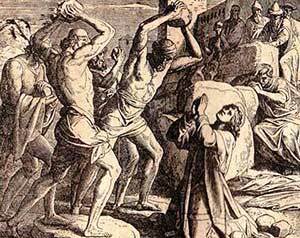 Under Septimus Severus in 202AD, Christianity underwent a period of extreme persecution. In 250AD, Decius tried to wipe it out. Then Valerian carried on this work in 258AD. All these attempts failed. Even in the 'Great Persecution' of 303AD under Diocletian did not make much impression on its number of followers. It was during this period that two martyrs stand out. Alban of Verulamium along with Aaron and Iulius of Caerleon. Although it is widely accepted the execution of these three individuals took place in Diocletian's reign, there are writings that suggest the actual date was 208-9AD. Then Constantine came to the throne. He was a reformer and sympathetic to Christianity and so ordered the persecution to cease. In 325AD, he presided over the Council of Nicaea, which officially made Christianity the only acceptable religion in the Roman world. From then on, paganism declined. In 391AD, Emperor Theodosius decreed that all pagan temples be closed and all forms of pagan worship and ritual be outlawed. It was now the pagans who were persecuted.